There are 94 Assisted Living Facilities in the Birmingham area, with 1 in Birmingham and 93 nearby. The average cost of assisted living in Birmingham is $4,140 per month. This is higher than the national median of $3,346. Cheaper nearby regions include Bloomfield Hills with an average starting cost of $2,805. To help you with your search, browse the 473 reviews below for assisted living facilities in Birmingham. On average, consumers rate assisted living in Birmingham 4.5 out of 5 stars. Better rated regions include Royal Oak with an average rating of 4.7 out of 5 stars. Caring.com has helped thousands of families find high-quality senior care. To speak with one of our Family Advisors about assisted living options and costs in Birmingham, call (855) 863-8283. The pedestrian-friendly, prosperous suburb, Birmingham, Michigan, is a small town in Oakland County that offers a community for seniors to enjoy. Seniors age 65 and above are the third-largest group of the city’s population, and there are two senior centers in the vibrant town, with two others nearby. The Michigan Office of Services (OSA) regulates all services, including assisted living, for Birmingham's elderly residents. Each year, residents living in assisted living communities can expect 205 sunny days and 32 inches of rain. It can freeze in Birmingham, where temperatures could drop into the teens. Residents of the city pay more in living expenses than the state average. With a cost of living at 154, Birmingham is an expensive place to live for seniors. The state's standard is 97 and for the nation, it is 100. Birmingham has an array of community resources for seniors, including Next, an organization that offers educational programming and fitness, as well as more than one senior center. There are a few cultural organizations around the town that can keep seniors engaged. Also, seniors may delight in Birmingham's restaurants, which serve different cuisines for diverse tastes. Residents may also enjoy a performance by the Village Players or listen to a concert by the Birmingham-Bloomfield Symphony Orchestra. On a crime scale of one to 100, where 100 is high crime and one is low crime, seniors can take comfort in knowing that Birmingham has less violence than in the state average. The rate for violent crime is 31 for the state of Michigan, while Birmingham's rate is 23. The property crime rate is 28, which is slightly higher than Michigan's overall average of 25. Birmingham has few facilities from which to choose in the event of a medical emergency or illness, with the nearest major hospital in West Bloomfield. Assisted Living costs in Birmingham start around $4,140 per month on average, while the nationwide average cost of assisted living is $4,000 per month, according to the latest figures from Genworth’s Cost of Care Survey. It’s important to note that assisted living rates in Birmingham and the surrounding suburbs can vary widely based on factors such as location, the level of care needed, apartment size and the types of amenities offered at each community. 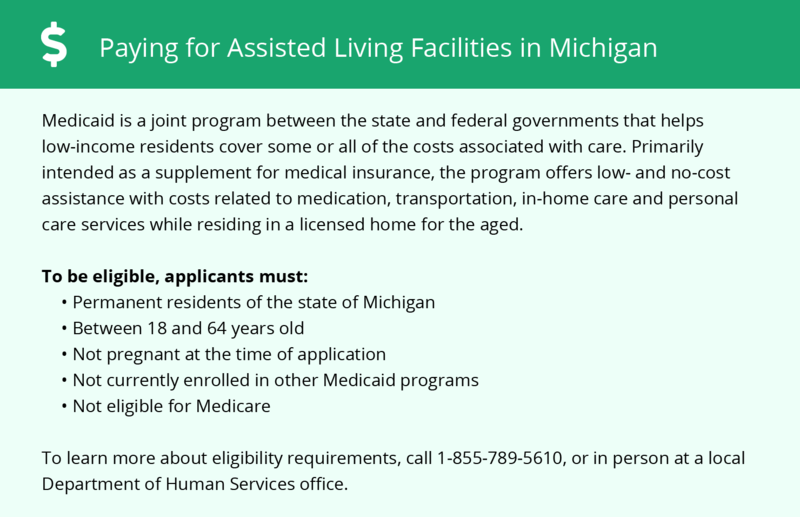 Michigan offers a managed care program called Health Link to pay for assisted living facilities. The program is exclusive to those elderly residents who are eligible recipients of both Medicare and Medicaid. The Choice Waiver Program in Michigan will cover the costs of care and residence for seniors in assisted living communities. 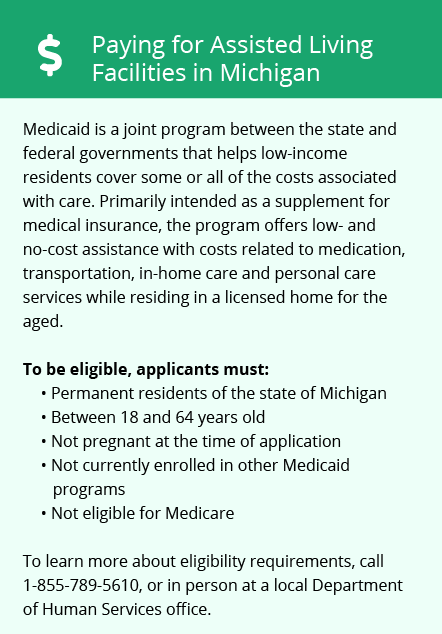 Unlike many other states, Michigan evaluates the cost of living and recurring health care expenses for income eligibility for Medicaid applicants instead of putting a hard limit on income requirements. To see a list of free assisted living resources in Birmingham, please visit our Assisted Living in Michigan page. Birmingham-area assisted living communities must adhere to the comprehensive set of state laws and regulations that all assisted living communities in Michigan are required to follow. Visit our Assisted Living in Michigan page for more information about these laws.